The Labour leader has an uphill battle to beat Prime Minister Theresa May’s Conservative Party in June’s snap election. 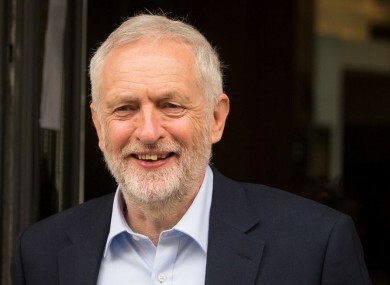 BRITAIN’S LABOUR PARTY has promised to introduce four new public holidays if it wins the June snap election, marking the patron saints days of England, Scotland, Wales and Northern Ireland. Labour leader Jeremy Corbyn said the measure would “give workers the break they deserve” while also uniting the four nations, whose ties have been strained by the vote to leave the European Union. Corbyn has an uphill battle to beat Prime Minister Theresa May’s centre-right Conservatives in the vote on 8 June, with weekend opinion polls putting Labour between 11 and 25 points behind the ruling party. May wants a mandate for the Brexit negotiations, which will start after the election, but Labour is emphasising the government’s record of spending cuts. “These holidays will be a chance for workers to spend time with their families, in their communities and with their friends,” Corbyn said. The holidays would be held on the days of St George — patron saint of England (which is being celebrated today) — St Andrew (Scotland), St David (Wales) and St Patrick (Northern Ireland). Last year’s Brexit vote has renewed calls by Scottish nationalists for a second referendum on independence, and in Northern Ireland the prospect of a hard border with EU member Ireland has also sparked concern about the province’s fragile peace. Britain currently has eight public holidays each year, compared with an average of 12 in the G20 of developed nations, the Labour Party said. Email “Jeremy Corbyn vows to introduce four new public holidays in UK ”. Feedback on “Jeremy Corbyn vows to introduce four new public holidays in UK ”.